An all-grain brew day starts with heating the water and milling the grain. Learn the best ways to mill your malt. Through trial and (especially) error, Terry Foster finds out how (and how not) to build an electric homebrewery. Want to take complete control of your beer’s flavor? Then malt your own barley! Everything you need to know is here. Q Can you blend an already carbonated sour with a fresh brewed non-carbonated beer without any issues? Scott Mead Via Facebook A There are many ways to blend, and for numerous reasons. We all love to drink tasty, cool-fermented lagers, but when it comes to fermenting them it is sometimes easier said than done. 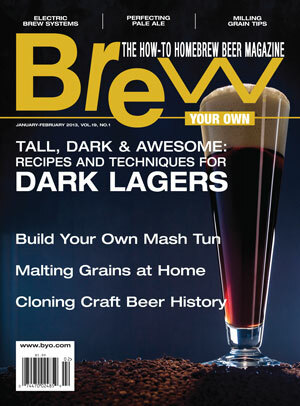 in this issue, two lager experts discuss some advice for running your best lager fermentation. Keep your mash temperatures constant by building your own internally heated mash tun. The Wiz gives a sweet answer to a question on blending with a sour beer as well as some insight about mashing malts. The first modern microbrewed ale in the United States was New Albion Ale. Learn how to brew this historic ale.